The things I do for you people! I have made beef jerky FOUR times in the last couple weeks in an attempt to get it right! Now I know why people were giving me the goggle-eyed I’m impressed look when I told them what I was up to. Who knew jerky was so ... jerky? And taking a decent picture of beef jerky – the ugliest food ever – is an impossibility, I assure you. Before you go off shopping for a martyr medal in the shape of a cow, know that I had my own reasons for pursuing this Quixotic feat. You see, this winter I'm learning how to snowboard because I'm forty years old and crazy like a fox. Somehow I got it in my head that if I could force this old body to learn something new, unfamiliar, and completely terrifying, I would be able to keep the whole old lady thing at bay for just a touch longer. Also, it just looks really, really, really fun. So I did it. I am now proudly carving and shredding and loving every second of it. A few weeks ago some kids yelled “Go Snowboarding Lady!” from the chairlift and I actually pumped my fist in the air. Me! I don’t pump my fist, people. I’m not gonna lie. It’s a cool feeling. Are you wondering where beef jerky comes into the picture? If you think I’m using SGT as a platform upon which to brag about my mad new skillz, then you would only be partially right. My friends, you can imagine how hungry a girl can get after a couple hours of snowboarding. It was on a chairlift, with my stomach rumbling, that I concocted my plan to make my own beef jerky. What could be better than pulling a cold, salty, chewy piece of beef out of my pocket on a chair lift? 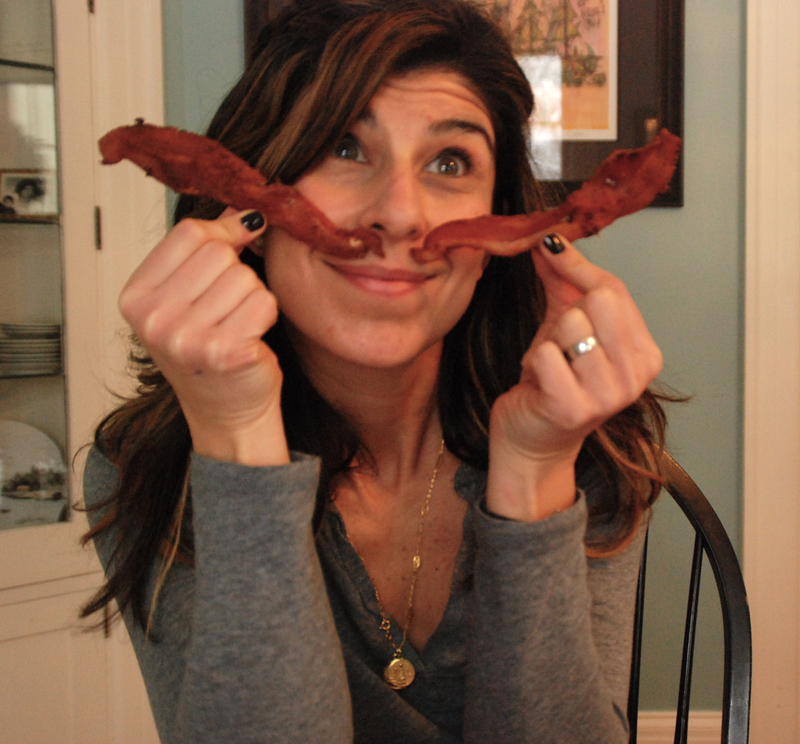 Of course, the chairlifts here in Minnesota are too short to chew through a piece of jerky, so my reverie took me out west to eat this jerky that I would make, where I would have plenty of time to savor the meaty deliciousness between runs. Oh, what a plan! I decided to get to work. Like People Magazine, Cheetos and other things you can purchase at a gas station, I’d say beef jerky qualifies as a guilty pleasure. It’s so salty and old! And the meat? Honey, don’t even go there. But when you think about it, there doesn’t have to be anything guilty about it. 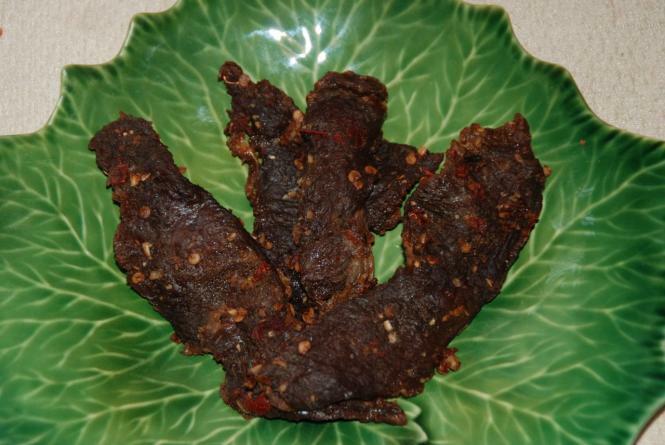 If you make your own jerky with some lovely organic, grass fed meat, then it can actually be a healthy, low carb, high protein snack (best accompanied by a sweeping vista of the Rockies ... or, you know, Highway 35W). The first batch I made with chipotle and smoked salt tasted fine, but was more akin to beef crackers than jerky. I have no problem with beef crackers in theory, but I have to admit it felt a bit unseemly to be crunching through meat in such a fashion, even for me. I concluded that I had over dried the jerky and tried again with another recipe and a lower oven temperature. This time the recipe called for soy sauce, ginger, and sesame oil, which was also tasty, but the meat wasn’t chewy enough. It just wasn’t jerky. So I went back to the first recipe and removed half of the meat from the marinade to dry on a cooling rack in the fridge overnight and left the other half in a Tupperware. Then I cooked it on the cooling rack and left the oven open about an inch and that did the trick. There was no detectable difference between the jerky that had dried out over night and the stuff that I had left in the marinade, so I would skip that step. The cooling rack and the open oven, however, allowed enough of the moisture to escape while keeping the cooking time down. Can you even believe how Cook’s Illustrated I’m getting on y’all? But if you think my Goldilocks adventures end there, you’d be wrong because the last batch, although perfectly chewy and gnaw-worthy, was way too salty. Perhaps I’d missed that the first time since the texture was so off. Tracy Morgan was right about smoked salt – a little does go a long way. So I tried the whole thing again, halving the salt and you know what? This jerky tastes Just Right! I am including the recipes for both marinades because I thought both were good and who doesn’t want a little jerky variety? The cooking process for both is the same. Enjoy! Place meat in freezer for an hour or so before you start. This will make it a lot easier to slice. 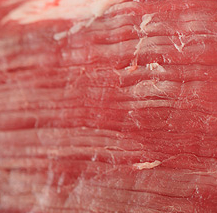 Using a sharp chef's knife, trim meat of all fat (the fat will get rancid) and cut into strips roughly 1/8 to 1/4 inch thick, with the grain. Combine remaining ingredients in a large zippered plastic bag or glass baking dish. Add sliced meat and coat with marinade. Refrigerate for at least 3 hours, or overnight, turning a few times to distribute the marinade. Place sheets of meat in oven and allow it to dry out. This can take as little as 2 and as many as 6 hours, depending on the thickness and moistness of the meat, and how chewy you want it to be. Jerky will firm up as it cools. Check the oven temperature regularly to ensure it does not get too low (some finicky oven pilots can go out at such a low temperature) and adjust as needed.